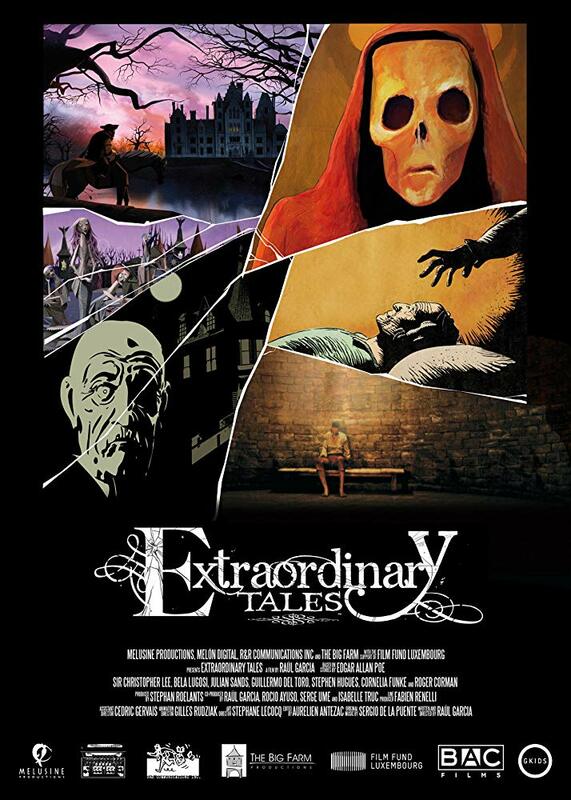 Extraordinary Tales is an animated collection of five different works by Poe. The first is The Fall of the House of Usher that's done in a style that I can only describe as a cut scene in an indie game. Follow that with The Tell Tale Heart resembling the black and white Frank Miller comic Sin City. Up third is The Facts in the Case of Dr. M. Valdemar which looks like it's taken straight from the pages of EC horror comics. Next on deck is The Pit and the Pendulum which reminds me of the 2000's Prince of Persia games. Finally, on clean-up is The Masque of the Red Death which is a combination of pastel or oil art mixed with computer animation. I'm 100% recommending this film. Not only is each one linked with extra animated scenes, but you have the voice talents of Christopher Lee, Guillermo del Toro, and a recording of Bela Lugosi running narration. The highlight of this collection would have to be The Masque of the Red Death where it's told almost entirely with visuals. I am giving an additional shout out to The Facts in the Case... because they drew Mr. Carmichael as Vincent Price, which is a holler back to 1962's Tales of Terror where Vincent Price played Valdemar. It's a hell of a reference pull that only a few might get and I have to give extra props for that.